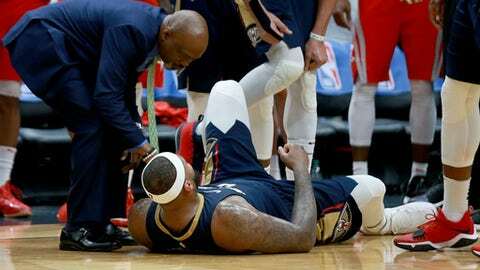 NEW ORLEANS (AP) DeMarcus Cousins raced down the lane after his missed free throw, trying to make a hustle play and help the New Orleans Pelicans preserve a signature victory over one of the NBA’s elite teams. Moments later, Cousins was sitting on the court, pain in his foot and shock on his face. He tried to get up as his teammates pursued the Houston Rockets toward the other end of the court, then went back down on his back and placed both hands on his head. Anthony Davis scored 27 points, Cousins had 15 points, 13 rebounds and 11 assists before seriously injuring his left Achilles tendon, and New Orleans survived a furious Houston rally for a 115-113 victory on Friday night. A person familiar with the situation said an MRI confirmed an Achilles tear, ending Cousins’ season a little more than a week after he was voted an All-Star starter. The person spoke to The Associated Press on condition of anonymity because the Pelicans have not yet announced the imaging results. The injury, which occurred with 12 seconds left in the game, all but squelched the jubilation from the Pelicans and their fans, who otherwise would have been celebrating not just a victory over the team with the NBA’s second-best record, but a fourth straight victory overall and seventh in eight games. ”We were just figuring everything out. That’s the tough part,” Davis said. ”We’ve got to keep going and just keep finding a way to win. Jrue Holiday scored 21 points and unconventionally sealed the victory by purposely missing a free throw with 1.8 seconds left, causing time to run out as players grappled for the rebound. Darius Miller hit six 3-pointers, including one with 1:52 left to give the Pelicans a five-point lead, and finished with 20 points. Chris Paul scored a season-high 38 points before fouling out in the final seconds and nearly led Houston back from a 21-point, third-quarter deficit. James Harden had 23 points and 11 assists, and Eric Gordon scored 27 points. Houston tied it at 104 on Luc Mbah a Moute’s layup with 2:34 to go. And the game was tied once more at 109 on Trevor Ariza’s 3 with 1:17 to go before Holiday’s driving floater and Cousins’ follow shot gave New Orleans the lead for good. Rockets: Harden moved into second in Rockets history in assists with 3,347, passing Allen Leavell’s 3,339. … Harden missed eight of nine 3-point attempts, although six of his free throws came after he was fouled on 3s. … Former Pelican Ryan Anderson, who came in averaging 10.1 points, did not score, missing all three of his shots. Pelicans: Piled up 24 assists on 27 field goals in the first half, after which they led 66-53, and finished with 36 assists on 44 made shots. … Recently acquired guard DeAndre Liggins contributed a pair of timely 3s in the second half. … Davis scored 16 points in the first quarter, highlighted by two alley-oop dunks. The Rockets’ comeback bid began after Miller’s 3 gave the Pelicans an 81-60 lead with 5:54 left in the quarter. Houston responded with a 20-6 run, during which Paul scored 10 on two 3s, a layup and two free throws. However, Paul committed his fifth foul with 7:29 left, and went to the bench for more than three minutes, during which the Pelicans’ lead crept back to eight. Paul returned with four minutes left and the Rockets scored the next eight points to tie it. Rockets: Host Phoenix on Sunday. Pelicans: Host Los Angeles Clippers on Sunday.